The Scion iQ is a focussed city car with four seats that works well in densely populated areas. 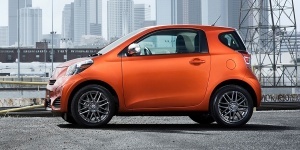 Powered by a 1.3-liter engine, the Scion iQ provides decent acceleration but lacks sportiness. The Scion iQ carries over to 2013 virtually unchanged. Find the used Scion iQ of your choice from a dealer in your area. Search our used car listings now.